APEX Driving Events was launched by Daniel Bloom in 2014. 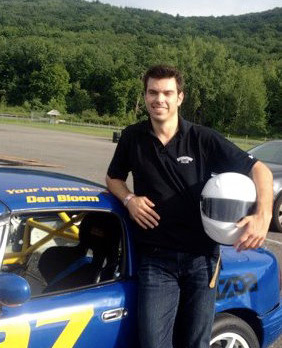 Daniel Bloom has had a life long passion for sports cars and motorsports. Being the youngest member of a family with many car guys, he grew up in the passenger seats of sports cars. The seed was planted and extremely well watered from a very young age. When he graduated college his first job was working in sales for Porsche cars. Unable to acquire one at the time, he was finally able to experience firsthand what had always dreamed of owning. This exposure quickly turned into a slippery slope. Before long he had a BMW M3 in the garage and was out on the track every free minute he had. After years of attending high performance driving events and various racing schools, he quickly realized his ideal driving outlet didn't exist. There were the mostly crowded and unstructured traditional "track days" on one end of the spectrum and there were very structured, full on racing schools on the other, but nothing in-between. This realization was the impetus to launch Apex Driving Events. Currently Apex operates out of 5 different tracks on the east coast and has hosted over 250 + drivers since it's inception. We have a crew of 12 highly accomplished racing drivers whom are part of the Apex Team and a crew of 5 support team members to make sure each event runs smoothly. Connect with Us Contact Daniel Bloom at dan@apexdrivingevents.com or 617-852-8123 to learn more about APEX or to book your next APEX driving experience.